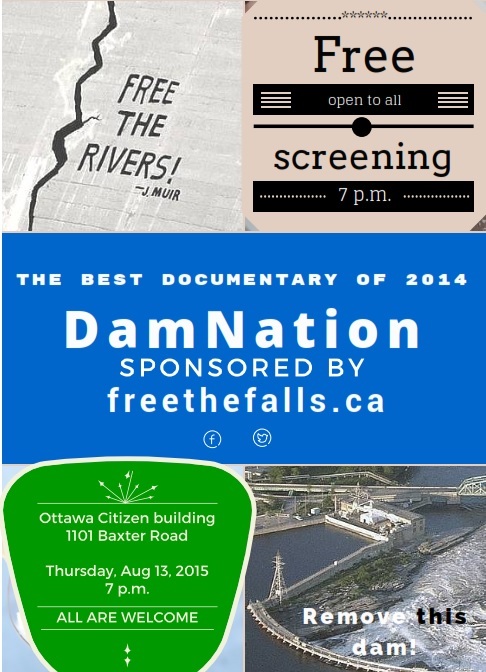 Come to a free screening of DamNation, a documentary that tells the story of grassroots people working to free the dammed rivers of the U.S. Made in 2014, the film takes you from coast to coast in the lower 48 where dams, large and small, are being decommissioned and rivers are flowing free again. The screening on August 13 will be the first in Ottawa. Admission is free. Tell your friends. Bring popcorn!